It’s been a cyclone of teasers, leaks, and fan theories, but the Fortnite: Battle Royale Season 4 is finally here. This Season the theme is (drumroll please) SUPERHEROES! It arrived in style early this morning with a slick little cinematic that showed off one of the new skins and set up the beginning of the narrative for the season. Coming with all this hype is the fabled Season 4 Battle Pass, with all new exotic items that most haven’t expected. In Season 3 most of us Fortnite players were looking to the skies as a bright blue comet slowly made its way to Earth, but now that comet has smashed into Dusty Depot and left a crater in its wake. 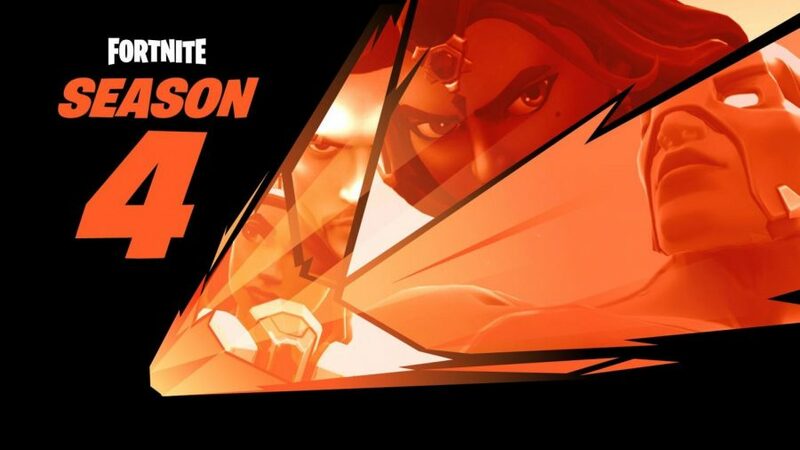 Now let’s dive right into the Superhero-themed Season 4 Battle Pass. Some of the new editions in Season 4 was the addition of Risky Reels and Dusty Divot, except that Dusty Divot (formally Dusty Depot) got hit by the giant meteor. In Season 3 most of you guys have seen the giant blue meteor that was “supposed” to hit Tilted Towers hit Dusty instead. Epic Games employees have apparently wanted to remodel the Dusty Depot for a while now and Season 3 gave them the perfect chance to do that. There are also small craters all around the map that have some chests, something all the craters have in common is the new Hop Rocks. They make you jump higher than normal and negate all fall damage while the effect is still lingering they can be found all around the map in craters. They are also more small factories around the map and two mansions, one is near Snobby Shores on the side of the huge mountain and the other is behind Dirt Track. Those are most of the new editions in the map, now let’s take a look into the Battle Pass. The challenges for season 4, week one are: Deal damage with Sniper Rifles to opponents (500), Search Chests in Haunted Hills (7), Use a Port-a-Fort, Search for the F-O-R-T-N-I-T-E Letters, Follow the treasure map found in Tomato Town, Pistol Eliminations, Eliminate opponents in Flush Factory. Week 1’s challenges come with some new twists. Not only do we have the regular list of challenges, they also added new Blockbuster challenges and the new Carbine and Omega challenges that players will need to pursue throughout the season. They might have something to do with the movie cameras all around the map. Along with those, a lot of new skins emotes, and gliders that look amazing, they make this season very unique and cool. Those are the major changes of season 4, hope you enjoy it.